As a small company, you will consult directly with the person who is doing the work from first contact, during the quotation process, through to completion of the work you need done. This means that you get a very personalised service with free advice that is sound from the get-go with a friendly, long-standing industry professional. We will quote so that the job can be done efficiently, but with attention to detail and always with safety in mind. Our competitive quotes are free. We will communicate with you every step of the way and turn up for appointments when we say we will be there. Please note that on occasion certain jobs take longer than anticipated and if we happen to be running late, we will advise you in plenty of time. At Tejas Trees we take a holistic approach and therefore we will work with you to preserve trees wherever we can; we will not advise work that does not need doing, preferring instead to take a long view around your needs. We look carefully at tree health and longevity and interaction with the natural and built environment to find equitable solutions to your tree problems relating to neighbouring properties, pools, buildings and solar panels. We take pride in our work and make every effort to take care of your property while on site doing a thorough clean up prior to departing. We are fully insured for your peace of mind. 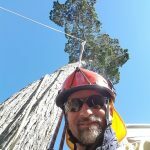 Our tree work services include palm cleaning and removals, pruning, weight reduction and shaping of trees and shrubs, boundary prunes, technical climbing work and full tree removals. We can arrange to have the stumps ground.